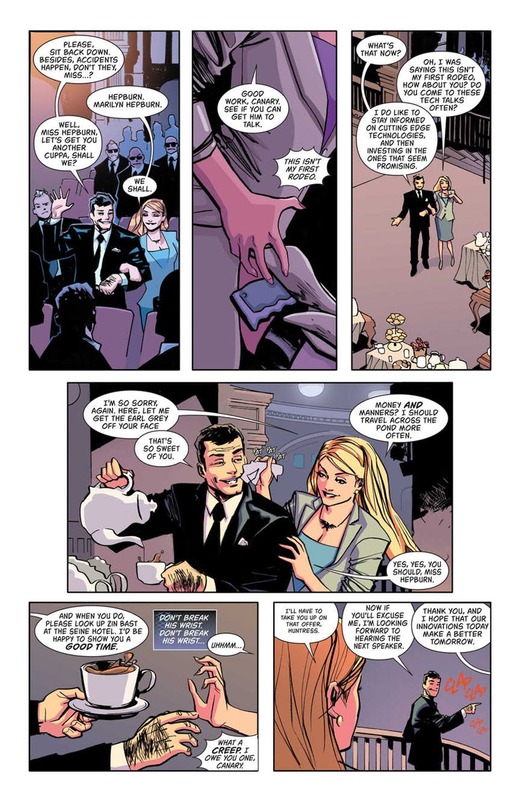 There’s a really smart moment in Batgirl And The Birds Of Prey #18, one that gleefully plays around with the complaints of some fans who have noted one particular recurring plot hole throughout this series. It revolves around Black Canary not really having much of a secret identity, and seemingly not caring about anybody who knows who she is. The Birds of Prey have just smashed up a hotel room in a fight with the bad guys. As they race out of the room, a hotel porter recognizes her. Rather than trying to talk her way out of being busted, instead she embraces it and passes off all the damage that they’ve done as typical rock star/hotel room shenanigans. It’s so simple it’s practically a moment of genius. Okay, so that same plan may not work for every scenario the team find themselves in but, in this case, it absolutely works and it’s a genuinely amusing moment. For that reason alone, I’m not giving Batgirl And The Birds Of Prey #18 a worse score than it’s already getting. That moment made me smile, so I’ll give it some credit. However, the rest of this issue is yet another poorly plotted and badly written story, beginning with the shaky premise. Huntress and the Birds of Prey are recruited by her old spy network Spyral to investigate Zin Bast – a suspected arms dealer who is currently in Paris, attending a conference on energy sources. While the BoP are operating undercover, Bast kidnaps Dr Yenokida, a young scientist who has created HAP-E, a power device which is resistant to electromagnetic pulses. Bast uses HAP-E to fuel the Weather Wizard’s wand and embarks on a plan to hold countries hostage. Can the Birds of Prey rescue the scientist, retrieve his power device, defeat Bast and save Paris before it’s too late? The idea that a well-equipped organization of spies would call in an outside contractor to do a job just because they didn’t get an invitation in the mail is ludicrous. 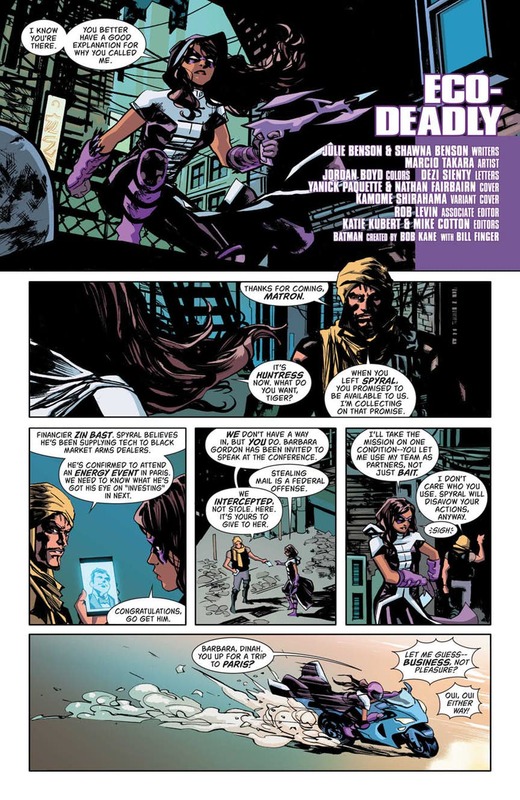 If they’d given some other reason at the end – like wanting to use more expendable agents, or secretly using the operation to recruit the Huntress again – that would have been fine, the sort of manoeuvre worthy of Amanda Waller-type status. Yes, Spyral does offer Huntress a job at the end, but that wasn’t the reason for sending her. Instead, they give a flimsy reason at the start and it is what it is. Piled on to that unstable foundation is a mindless adventure full of bizarre plot holes, ranging from the person who committed the kidnapping leaving clear evidence in his seat at the conference proving that he’s the villain, to his lair being the hotel room where he’s registered under his own name. The Birds of Prey drag Dr Yenokida into increasingly dangerous situations where his life is repeatedly threatened, while Bast’s plan seems increasingly random and poorly planned – which, for a guy who’s tried staying off the radar of the authorities for years through being careful, makes no sense. As usual, the dialogue is painfully unnatural and clunky and tries to fill in the blanks of the tale with chunks of exposition – which wouldn’t have been necessary if more thought had gone into the story. The old adage of “show, don’t tell” is one which should be followed more by the writers. Regarding the art itself, Marcio Takara does a solid job. 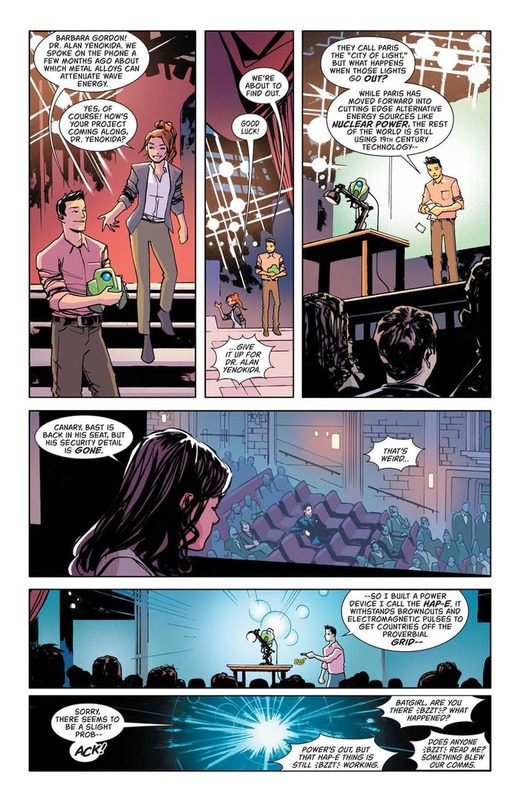 Unfortunately, owing to the way the story is written, the pacing of the art in some scenes appears off and the actions in some panels don’t necessarily follow in a fluid way. If you’re after a brief and harmless distraction, then the join-the-dots style Mission: Impossible narrative may suit your tastes. However, if you’re hoping for a proper Birds of Prey adventure which shows the characters at their best, you’ll have to look elsewhere. Yes, there’s that one solitary moment of genius in Batgirl And The Birds Of Prey #18, but sadly it’s buried under all the mediocrity of the rest of it.